For some reason when I saw this week’s topic for the Monday Listicles, a scene from Bring It On kept running through my head. Thus the title of this posting.
. Update: I just realized that the screen capture for this video is a bit vulgar. Sorry about that. But the clip is still funny, so I’m not going to take it down. Cracks me up. Everytime. Plus, I’m convinced that if I had a dollar for every time that Bring It On or one of its many sequels is on the air, I’d never have to work again. It has taken over the top spot from Legally Blonde. Still in second place is Harry Potter and any of the movies in that franchise. 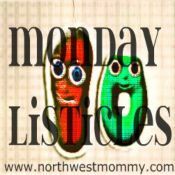 Anywho, this week’s monday listicles reminds me so much of my childhood. There are so many smells I associate with childhood, that in a single whiff I’m right back to the kitchen table either playing or eating. Play Doh. A fresh, new can of Play Doh. That first whiff of fresh burning tobacco. You know, before the coughing and hacking begins because it’s just so nasty. I had not thought of Play Doh…nice call on that one. Play doh – that’s a great one! I never saw Bring it On, but I may have to after watching that clip. Coconut bath and beauty products are really appealing. Sometimes, they smell good enough to eat. I completely forgot!!!! Play-Dough – I also sniff it when I get a chance. I am surprised I haven’t tried to taste it in my lifetime.